Most drummers dream of one day being able to make a living from playing. Some want to tour with a platinum selling artist, others want to spend their days in the recording studio, while others want to stay closer to home and lead the best club band in town. The common thread that links them all is the desire to have a career in music and spend their days playing the drums. This might sound obvious but many players try to jump in the deep end without having the skills to keep them afloat. Remember, you only get one chance to make a first impression so get your playing together before you put yourself out there. You should have a great ear, great timing and the ability to play all styles authentically. If you get lost you should have the musical know how to play off the other musicians and keep it rockin’. The “standards” are the most commonly played and commonly requested tunes you get on gigs. They are the classics from Jazz, Swing, Rock, R&B and Pop that people expect to hear and are a real must if you plan to do higher paid function and wedding work. Check out the websites of function bands in your area then have a look at their repertoire. Download and learn these tunes to the best of your abilities. You may not like all the tunes but you’re sure to improve as a drummer by listening to and playing them on a regular basis. The ability to read charts and create your own charts will allow you to play songs with minimal rehearsal and learn a large body of work very quickly. This skill is vital the higher up the musical ladder you climb. Sometimes you will be given a chart and expected to play it there and then, sometimes you will have a day to learn a whole new setlist. You’ll find yourself in these challenging situations so keep your reading and transcribing skills sharp – if bandleaders know you can do it, it will increase the chances of you getting the call. A freelance drummer who can sing backing vocals is a VERY marketable commodity for most original, club and function bands. If you can sing then work on your chops and let people know about it. You’ll be offering a real service and it’s a good point of differentiation between you and the other drummers in your town. One of the most important things of all is your level of professionalism. 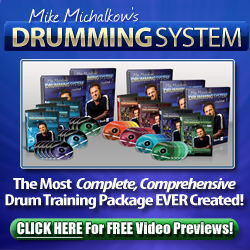 People want to work with drummers who are reliable and fun to be around. Stay positive, arrive early, and be ready. If you prove yourself as a real asset time and time again and strive to be the best in your area then your name will get around and good things will happen for you. This really is a word of mouth business so make sure everyone is saying good things about you. Having a car helps, being able to assist the sound man helps and having a real knowledge of the business will set you apart and keep the phone ringing. As Russ Miller said in a recent interview, “If you just step back and look at it like a basic business then ask, ʻWhat would it take for me to be one of the most popular lawyers in the world?ʼ You would have to be extremely knowledgeable and proﬁcient at your craft. You should present yourself well with business cards, a website and a YouTube resume that represents your best work. Keep at it over the years and strive to build a trustworthy ‘brand’. The more time you spend around working drummers the more you realize that they are involved in many projects and have multiple streams of income to keep them going. They do gigs, clinics, recording sessions, teaching, writing for magazines, composing, producing, etc. If you are willing to be flexible and do other things as well as your drumming then you can earn the same kind of living (if not more) than the average 9-5er. The key to remaining busy throughout the year and throughout your career is to continuously be on the hunt for your next gig. That means making contacts, letting people know your availability and keeping up your ‘marketing’ efforts even when your current plate of work is full. Just because you’re busy now doesn’t mean you will be next month or the month after that so keep looking for new places to play. If you don’t, you could quickly find yourself without an income. Remember, it often takes a few weeks (if not months) to secure a gig. You need to balance your time between working on actual projects, and pursuing new opportunities. Freelancing can be tough but it’s very rewarding. It gives you the opportunity to make a living doing what you love and a real foundation for growth as a musician. There are many avenues for you to perform and many career opportunities for you to follow. You may be a hired hand for a few years but want to transition into production work, songwriting or education. Whatever you decide to do over the long term, the skills you develop as a freelancer and the connections you make will give you a great start in the industry. So, do your homework, get your skills together and get out there. There’s no replacement for on the job learning so now is the time to start.